Hot Roll Coding Machine suitable to neat, sharp & registered print Batch Number, Date Of Manufacturing, Expiry Date, Prices, best before dates, traceability codes, batch codes & other statutory information with the help of the Characters with Aid of Brass Letters. The Print wheel equipped to Dry-Ink Coding Machine can be used for both R arrange and T arrange of characters. In T arrange Solid-ink Coding Machine can print 1 to 10 characters in each line. 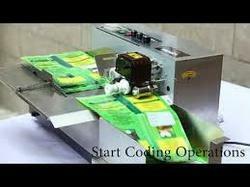 In R arrange Solid-ink Coding Machine can print 1 to 8 characters in each line. Automatic Labels & Pouch Dispensing Machine with automatic feeding System, Stack of Pouches is pulled or pushed by roller & collected from the tray after printing the message. It is sensor base machine so it takes one by one and prints at the accurate place. It also adjustable printing and it is also having auto counting. Automatic Coding Machine used for thin cardboard, aluminium foil, printing label on paper and plastic film dry ink coding very high resolution, fast printing, fast dry can be select and strong impression. Stacker Machine is complete solution for print labels coding and markingneeds in the pharmaceutical industry, Food and grocery industry, Fresh Produce, Frozen Food, bakery products, Cosmetics bottle labels, cartons and pouches. Batch coder machine very easy to operate those whose production requirement of approximately 10000 to 25000 pieces per day to print help with special dry ink cartridge for strong and permanent marking on most shiny surfaces, including shiny papers, most plastics. Automatic Dry-ink Coding Machine can be used to print notes such as production date, lot number on the plastic and paper bags, in food and pharmaceutical industries. The words printed are clear and endurable against wear and tear. We are pleased to informing you that Universal Packaging Solutions is (ISO 9001-2008 CERTIFIED COMAPANY) a professionally managed company. The aim of our company has been to provide our customers with a 'One-stop Solution’ for the Consumable and Spares required for different types Packaging Machine. We are offering an ever increasing range of products, carefully selected with due considerations to all factors such as quality, product range & prices. We strive to full fill all requirements of the Packaging Machines related requirements in the shortest time frame and at the best prices. We are supplying complete ranges of spares required for the below mentioned packaging machines. [a] Pouch Filling Machines of Samarpan, Nichrome, Arvindpack, RMC etc. makes. [c] Strapping Machine ITW, Signode, Packway, Joinpack, Vibgyor & Concept –Packaging etc. makes. MRP Rs. , Batch No. upon pouches. [e] Band Sealer Machine and L Sealer Machines spares. [f] Auto Labler Machines Spares. We are supplying so many types of spares required for the above mentioned machines. Some of frequently required spare parts list are as follows. Teflon Tape, Teflon Cloth, Teflon Belt Indian and Imported makes. Band Seal Electrode, Vertical Electrode, Cutting Electrodes, Heating Cartridge, Heating Element, Cutter Blades, Sealing Jaw, Back-up Rubber, Nip Rollers etc. Pneumatic Cylinder, Solenoid Valve & Fittings of Festo, Legris, Rotex, Jenatics & SMC Makes. Load Cell, Encoder, Encoder Coupling and Counter Meter. Servo Motor, Drive, VFD, HMI & PLC of Delta , Allenbradly & Siemens Make. Vast range of VFD of ABB, Delta, Allen Bradly, Siemens make. Fast Drying Ink, Inking Roller, Letter Set etc. required for the contact manual printers. Gear Box of Bonfoglic, Bonvario, Cyclo & Shanti makes. We are requesting you please register our name in your vendor’s list and forward us your valued inquiry. For further any information/clarification please feel free to contact us. It's our great pleasure to serve your esteemed organizations.